Every three minutes in Canada, someone receives a traumatic brain injury (TBI). A TBI can cause headaches, memory problems, and depression, as well as paralysis, speech and language challenges, and cognitive impairment. It is estimated that the economic burden of TBI is $12 billion per year in Canada. Despite the use of helmets, contact sports such as football and hockey account for a high number of TBIs. Given the popularity of these sports, how can we improve the players’ safety? It was 2010 and Daniel Abram had started a postdoctoral fellowship in mechatronic systems engineering at Simon Fraser University. 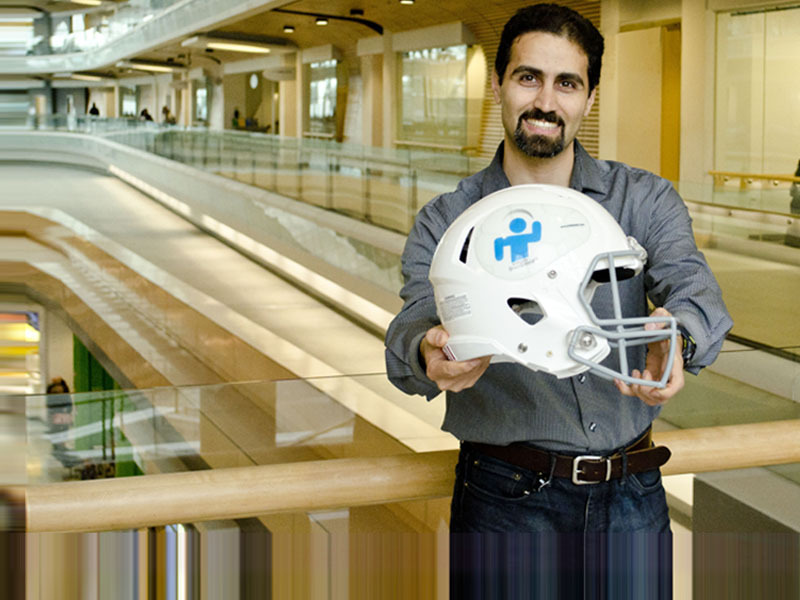 Originally from Iran, Daniel was challenged by his supervisor, Dr. Farid Golnaraghi, to find a way to make sport helmets safer. After looking into the issue for several months, Daniel’s team had a moment of clarity. To further the research, Daniel and Dr. Golnaraghi, in partnership with Innovata Labs, applied for three Mitacs Accelerate internships and later, a Mitacs Elevate fellowship. Through the internships and a fellowship, the team developed BrainShield, a micro-engineered layer that can easily be applied, like a decal, on top of the helmet, to reduce both sharp twisting and compression of the head during most of angled impacts. BrainShield from Shield-X Technology Inc. is the first-of-its-kind functional sticker made of micro-engineered layers that can easily be installed on the outer-shell of helmets and significantly enhances their protection. Less than 1mm thick, the decal enhances the protection of helmets and can either be transparent or printed with a team logo. In 2014, the coach of the Simon Fraser University football team, Jacques Chapdelaine, very interested in enhancing player protection, agreed to have his team test BrainShield for one season. According to him player concussions dropped from 14 in 2013 to only 4 in 2014. With relentless determination, Shield-X Technology secured venture capital funding in the fall of 2014 and is negotiating a license with an international manufacturer. With the future looking bright for Shield-X Technology and BrainShield, Daniel is quick to look back to the beginning of the project, to where it all began. Mitacs thanks the Government of Canada and the Government of British Columbia for their support of the Accelerate research internship in this story. Across Canada, the Accelerate program also receives support from Alberta Innovates, the Government of New Brunswick, the Government of Newfoundland and Labrador, the Government of Nova Scotia, the Government of Ontario, the Government of Prince Edward Island, the Government of Quebec, the Government of Saskatchewan and Research Manitoba.